Avner, Yehuda. The Prime Ministers: An Intimate Narrative of Israeli Leadership. The Toby Press. 2010. ISBN 978-1-59264-278-6. Eidelberg, Paul. Sadat’s Strategy. Dollard des Ormeaux: Dawn Books. 1979. ISBN 0-9690001-0-3. Haykal, Muhammad Hasanayn. 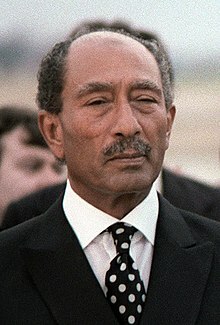 Autumn of Fury: The Assassination of Sadat. Wm Collins & Sons & Co. 1982. ISBN 0-394-53136-1. Hurwitz, Harry; Medad, Yisrael. Peace in the Making. Gefen Publishing House. 2010. ISBN 978-965-229-456-2. Meital, Yoram. Egypt’s Struggle for Peace: Continuity and Change, 1967-1971. Gainesville: University Press of Florida. 1997. ISBN 0-8130-1533-2. Waterbury, John. The Egypt of Nasser and Sadat: The Political Economy of Two Regimes Limited. Princeton University Press. 1983. ISBN 0-691-07650-2. Wright, Lawrence. The Looming Tower: Al-Qaeda and the Road to 9/11. New York: Knopf. 2006. ISBN 0-375-41486-X.